Jenn and Romy: California Newts! 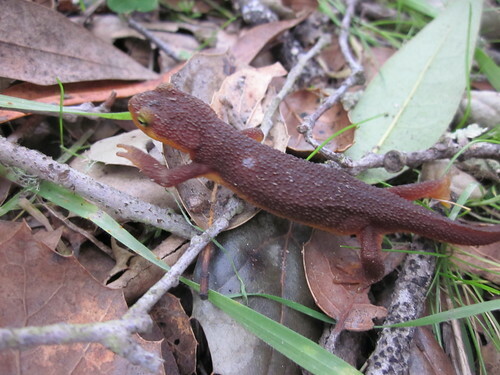 Its winter in California, so that means the newts are out! The newts that live in California are typically only found near the coast, but also live in the Sierra Nevada mountains. We found so many of them just happily crawling along the trail. They are poisonous if ingested, so they have very few natural predators. I thought they were poisonous to the touch, but apparently not. The poison is only harmful if you have a big cut on your finger or something. If a human for some reason or another decided to eat a newt or two, the poison it contains is enough to be fatal. 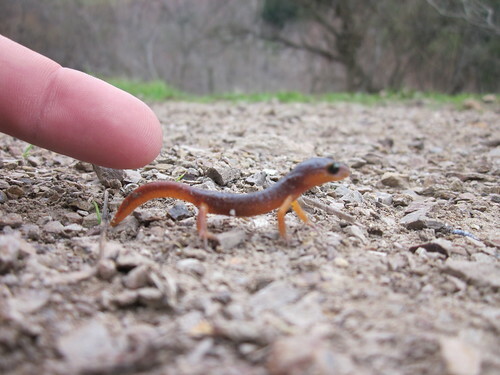 A teeny tiny newt (finger for scale). 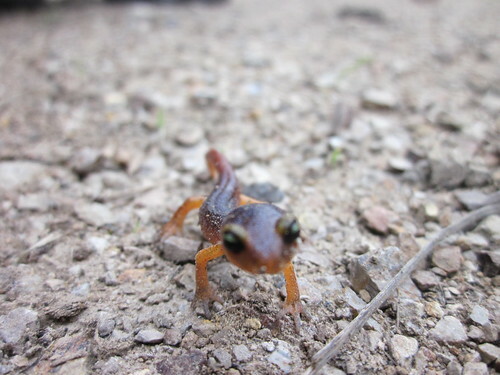 As we were walking along the King's Trail on EBMUD land, we took some pictures of some of the newts we saw. We found one tiny baby newt that was so cute. Newts can actually live for a very long time. It's been estimated that some newts are as old as 20 years old! In Tilden Regional Park, they close down South Park Dr. in the winter months to protect the newts that start wandering around to breed. Apparently, hundreds of newts were being run over by cars on that road. I've always wondered why they closed the road, and now I know (and you do too, but maybe you already knew that)! Close up of the same baby newt. A video we took of the newt walking. We saw some larger newts crawling around too, but they aren't as cute (at least to me). They are kind of scary because its very easy to step on them. They don't really get out of the way, and even if they did try, they crawl so slowly! They are colored to kind of blend in with the leaf litter and dirt on the trail, so when you get carried away talking as you're walking, or looking up a scenery, its easy to almost squash one! Luckily we didn't! 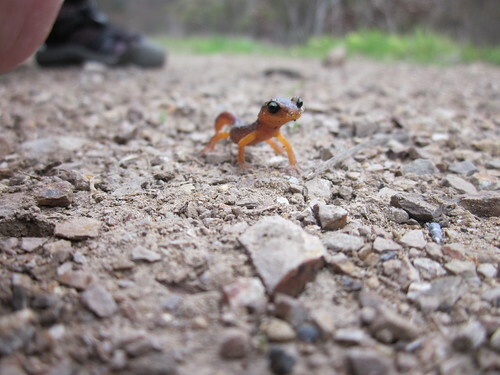 A larger adult newt, not as cute! I had a "pet" newt that lived by the water faucet in a shady area of our yard in Garden Grove. It scared me the first time I saw it, moving so slowly with that alien looking head. I was more used to the Blue Belly lizards that were so tough to catch - just when you thought you had one it's tail would detach and it would be gone, leaving a little puff of dust. Fun science experiment - we used paper clips to send current from a 9 volt battery to the inside of the disembodied tail to watch it twitch.